Good morning America. You are now entering Wisconsin, circa 2011. The left’s #Resistance movement today against all things Trump is what big labor brought the Badger State seven years ago when “progressives” stomped all over civility in a campaign to topple Republican Gov. Scott Walker. “What happened in Wisconsin … is being writ large across the country,” state Sen. Tom Tiffany, R-Hazelhurst, said last year following an anti-Trump Women’s March on Madison, complete with “F— Trump” signs and pink “pussyhat” clad protesters. That was in March 2017. Think about how much more nastiness and downright disorder has occurred since. Last month, the owner of a Virginia restaurant booted White House press secretary Sarah Sanders from the premises because Sanders works for President Donald Trump, and the eatery has “certain standards” to uphold. Days before a left-wing mob harassed U.S. Homeland Security Secretary Kirstjen Nielsen and colleagues outside a Mexican restaurant. The members of Democratic Socialists of America shouted obscenities and attempted to “Shame! Shame! Shame!” the secretary for standing up for border detention laws that have separated some illegal immigrant families. The protesters blasted the Trump administration, omitting the fact that former President Barack Obama’s administration separated children from their parents at the border in 2014. U.S. Rep. Maxine Waters, D-Calif., not known as a calming influence in Congress, then stirred up the pot of political incivility by calling on Americans to harass Trump administration officials in public places. Not to be outdone, a band of liberals swarmed Florida Attorney General Pam Bondi at a showing of a documentary about children’s TV host Fred Rogers and harangued the Republican official about Obamacare and immigration policy. Wisconsin conservatives have seen this movie before. In February 2011, just weeks into his first term, Walker announced his Wisconsin Budget Repair Bill, crafted to clean up a state budget mess. Also known as Act 10, the legislation reformed the state’s public-sector collective-bargaining laws – and really ticked off public employee unions. Tens of thousands of progressives descended on the state Capitol to demonstrate against Act 10, Walker, Republican lawmakers, and anyone who dared speak in support of reform. It was havoc. Capitol employees still talk about the sensation of working at a heavy metal concert for weeks on end. The din of the protesters was that loud. Losing in the Legislature, the state Democratic Party and a coalition of big labor liberals launched an unprecedented recall campaign against six Republican state senators, Walker and his lieutenant governor, Rebecca Kleefisch. The left failed again, picking off only one conservative lawmaker. Kleefisch won big and Walker became the first governor in U.S. history to survive a recall attempt. But the disorder liberals brought during the late winter of their discontent became the blueprint for the Resistance movement against Walker and Wisconsin conservatives. In late spring of 2011, as the recall movement was heating up, a gaggle of liberals dressed as zombies protested against Walker while the governor was hosting a ceremony for Special Olympians.They held their fists in the air, turning their backs to Walker, as he honored the work that Special Olympics does in the Badger State. A “Die In” was simultaneously held to protest Wisconsin’s voter ID law. Apparently proving you are eligible to vote in Wisconsin is like dying to the left. A couple months later, in early August 2011, a protester shouted, “Sic semper tyrannis!”at Walker as the governor made remarks on opening day of the Wisconsin State Fair. Sic semper tyrannis, or “Thus always to tyrants,” was the phrase John Wilkes Booth, Lincoln’s assassin, shouted after leaping from Washington’s Ford Theatre, seconds after he had fired a bullet into the president’s head. About 60 protesters were in the crowd that day attempting to shout down the governor’s speech. Chants of “Shame! Shame! 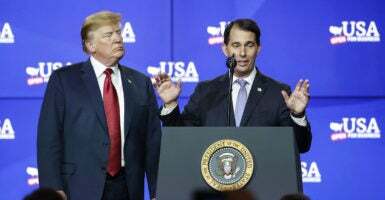 Shame!,” the rallying cry of the Walker-hating left, rang out as the governor welcomed an event that had for more than 160 years brought Wisconsinites together. The left likes to paint Trump as a despot, a tyrant, a modern-day Hitler. They are taking a page from Wisconsin liberals, many of whom carried signs with images comparing Walker to one of the worst war criminals who ever walked the earth. Former state Rep. Brett Hulsey, a Madison Democrat, may have topped them all in 2014, when he announced plans to dress up as confederate soldier and distribute Ku Klux Klan hoods outside of the state Republican Convention in Milwaukee. It was a statement, Hulsey, said, his way of calling attention to what he described as “Gov. Walker and the Republicans’ racist record.” He ran unsuccessfully for governor. After being blasted by Republicans and Democrats alike, he opted to forego the Klan stunt, but did don his makeshift confederate uniform. At a Tax Day rally in April 2012,as the overheated recall campaign burned on, anti-Walker protesters disrupted the singing of the National Anthem with an ode to hate. “Scott Walker tea-bagger!” a disheveled demonstrator hollered from the back of the crowd. He and some of his like-minded friends sang alternate lyrics as the Anthem wrapped up. Something about John Doe, presumably a reference to secret investigations into Walker, his aides and supporters by Democrat prosecutors. The second stage of the probe, “John Doe II,” would be ruled unconstitutional by the state Supreme Court. The majority opinion stated prosecutors wrought a “perfect storm of wrongs” against innocent citizens. While Trump officials have been confronted and harassed in public places, Wisconsin lawmakers during the Act 10 battles dealt with left-wing protesters stopping by their homes. Things escalated fast. Threats of violence became routine. During the Act 10 battles, Republican lawmakers received death threats from unhinged members of the left. Then-state Sen. Glenn Grothman found this message under his Capitol office door: “The only Good Republican is a DEAD Republican.” Grothman is now a U.S. representative from the Sixth Congressional District. Law enforcement officials at one point found dozens of rounds of live ammunition outside the Capitol. The message was not lost on lawmakers contemplating reforming Wisconsin government. Police reported that some Republican lawmakers discovered nails tossed on their driveways. More recently a La Crosse man, claiming he was upset after someone destroyed his Hillary Clinton for President sign, spread nails on the driveways of neighbors with Republican signs in their yards. Martin Sellers, 59 at the time, was sentenced to 180 days of community service on charges of disorderly conduct and criminal damage to property. The left took business boycotts to a new level in Wisconsin in 2011 and 2012. Union officials periodically threatened small and big businesses alike with boycotts if they didn’t publicly declare their support for government workers and their opposition to Walker and Act 10. At one point, a Facebook page titled, “Boycott Scott Walker,” had about 10,000 followers. Companies targeted included Wisconsin staples–Johnsonville Sausage, Sargento, Menards and M&I Bank. Some of Walker’s opponents thought the boycott effort went too far. Merely collateral damage to the left-wing cause of powerful unions and bigger governments. Turns out, a lot of voters in the old “blue state” Wisconsin thought the left had gone too far in its resistance movement against Walker and the Republican-controlled Legislature. In May 2012, after months of daily mainstream media coverage of the left’s recall campaign, 647,000 voters cast ballots in the Republican recall primary. Walker received 97 percent of the vote in a throwaway election. The Silent Majority was silent no more. In the June 2012 general recall election,Walker beat Milwaukee Mayor Tom Barrett, an establishment Democrat, for the second time in less than two years. Walker won by nearly 7 percentage points. Some voters said that they did not necessarily support Walker or Act 10, but that they had grown fatigued by the hostility, the rage, the disorder from the left. Did They Learn Anything From Wisconsin? While they continue to blame Trump as the root of so much incivility (the president certainly bears some responsibility here), many Democrats have grown tired of the bare-knuckle brawling style of some of their members and a disruptive Trump resistance movement at large. A recent Pew Research Center poll found 58 percent of voters voiced concerns about Democrats’ obsessive focus on investigating Trump, including 40 percent of Democrats surveyed. Nearly a quarter of Democrats answering a recent CNN poll said they disapprove of special counsel Robert Mueller’s handling of his investigation into Russian collusion – what had been the Democratic Party’s favorite talking point until the illegal immigration battle broke out. Democratic leadership is not blind to such discontent, as the far left storms the party and tries to remake it in a socialism image. House Minority Leader Nancy Pelosi, D-Calif., called out Waters for the congresswoman’s “unacceptable” comments. Of course, she simultaneously attacked Trump, but the broader point was not lost. “Trump’s daily lack of civility has provoked responses that are predictable but unacceptable. As we go forward, we must conduct elections in a way that achieves unity from sea to shining sea,” Pelosi concluded in her banal tweet. Wisconsin state Rep. Peter Barca, D-Kenosha, at the time minority leader of the state Assembly, had the same response in 2011 after multiple reports of bad behavior by liberal protesters. It would be hard to confuse Maxine Waters’ conduct with Gandhi or liberals holding “Trump is Hitler” signs as Dr. Martin Luther King-like. It all begs the question: Have liberals learned anything from the lessons of the past? It would seem, in many cases, they have not. The Wisconsin model should be a guide to Democrats on what not to do, or even countenance. It certainly was a valuable lesson for conservative political leaders everywhere on what to do: Deliver on your promises and voters will reward you.